Craft cider isn’t just for drinking! There are more and more food artisans including cider in their edible creations, a trend we’ll examine in this column, “Made with Cider.” Know of something made with cider that we should highlight? Reach out to us at cheers@ciderculture.com. Cider-washed cheese … are there any other phrases in the English language quite as beautiful? As we’ve discussed before, cider and cheese are not only delicious when consumed together, but amazing things can happen when the two become one. An exciting new example of this is Unified Cheddar, a collaboration between Citizen Cider and Vermont Farmstead Cheese Co.
As explained in a blog post on Citizen’s website, members of the cidery’s team got to actually go to Vermont Farmstead’s dairy farm in Woodstock, Vermont, and participated in the cheesemaking process. After going through the process of cheddaring, the curds were soaked in Citizen’s flagship off-dry cider, Unified Press, then aged for six months. The result, Unified Cheddar, is a super cider-friendly cheese that still has hints of apple-y goodness. Find it exclusively at Hannaford Supermarkets, with locations throughout New York State and New England. 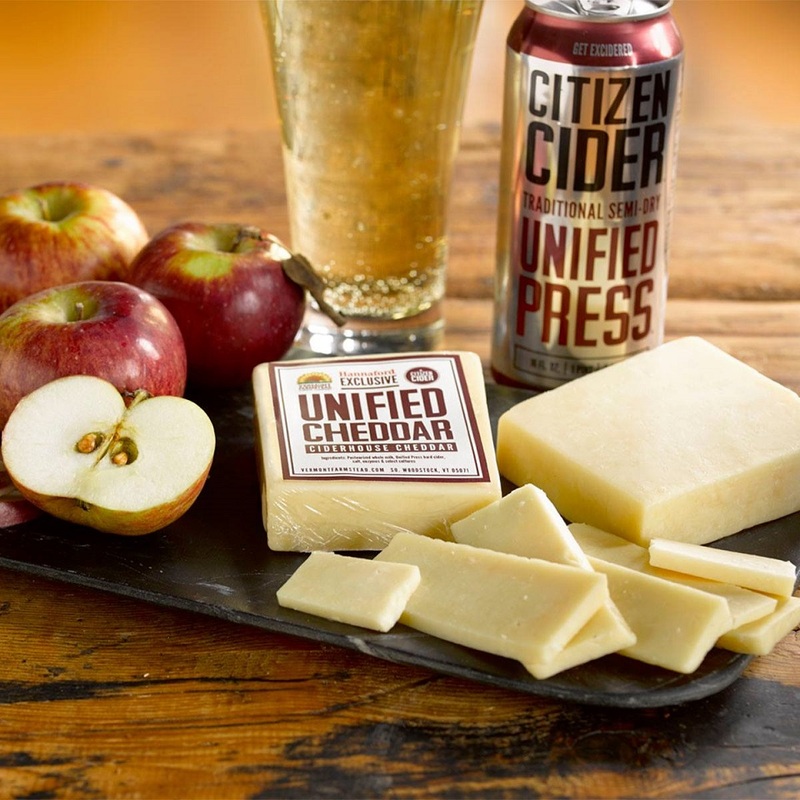 Congrats to Citizen Cider and Vermont Farmstead Cheese Co. on this excellent collaboration — we say, the more cider-washed cheeses in the world, the better!